The long-haul low-cost carrier Norwegian, is the latest airline to reveal that vegan meals are becoming more popular. First it was staff at one of the UK's biggest airlines that told us that vegan meal requests were at record levels. Then Dubai based Emirates informed us it had much higher numbers of vegan meals being requested and produced. Now it is the turn of Norwegian to pontificate that vegan meals are so popular among its 37 million passengers flown each year! This highlights the far reaching global campaign Veganuary to encourage more people to try veganism during January has reached record heights! Norwegian, offers affordable flights from London Gatwick to 12 US cities, Buenos Aires, Argentina and from 31 March, Rio de Janeiro, Brazil on brand new Boeing 787 Dreamliners. 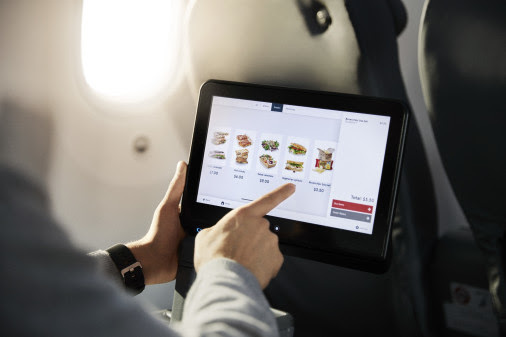 Customers have the flexibility to choose what best suits their travel needs including a meal service during flights. Norwegian offers a wide selection of meals that cater to all dietary requirements including vegetarian, lactose-free and gluten free options. Europe’s third largest low-cost airline analysed more than 7330 long-haul flights to and from London Gatwick between January 2018 and January 2019 to identify where there is most demand for vegan meals. More than 23,000 vegan meals have been consumed on board Norwegian’s long-haul flights to and from Gatwick since January 2018. The Veganuary campaign - run by a UK charity of the same name - encourages people to try a vegan diet, omitting meat, fish, dairy, eggs and honey from their diet for the month of January to promote health benefits. Findings comparing January 2018 and January 2019 show that more vegan meals are being consumed on Norwegian flights in 2019 as ‘Veganuary’ takes to the skies. More than 1400 vegan meals were ordered this January. On average, 7 per cent more vegan meals were ordered per flight in January 2019 versus January 2018. There was also a 5 per cent increase of vegan meals ordered in January 2019 from the previous month in December. Findings show that vegan meals are most popular on Norwegian’s daily flights between London and Los Angeles - 55 per cent higher than the average across all Norwegian long-haul flights. Oakland (San Francisco) is the second most popular route for vegan meals ordered on Norwegian – 31 per cent more than the average, highlighting the popularity of vegan meals on California routes. Vegan meal orders on New York flights are lower in comparison, in line with the average across Norwegian’s long-haul flights, despite the airline operating more flights between London and the Big Apple than any other route, with up to three services daily. Florida versus California – which state has more vegan passengers? Norwegian serves three gateways to Florida and two destinations in California with more than 15 flights per week to each state. As traditional sun destinations, by grouping the routes together, findings clearly show that vegans are more likely to be found on flights to California. On average, 78 per cent more vegan meals are ordered per flight between London and California as opposed to flights between London and Tampa, Orlando and Fort Lauderdale (Miami) in Florida. Of Norwegian’s 14 long-haul routes from Gatwick, the least popular route for vegan meals ordered by passengers on plant-based diets were on flights between London and Buenos Aires. Buenos Aires in Argentina, a country renowned for its high-quality steak, has 25 per cent fewer vegan meals ordered compared with the average across all long-haul routes. Matthew Wood, SVP Commercial at Norwegian said: “We offer a delicious range of meals that meet all our customers’ dietary requirements and this analysis clearly shows that being vegan is just as easy at 35,000ft as it is on the ground. Elena Orde at The Vegan Society said: “We’re very pleased to see Norwegian providing vegan options on-board their flights at a time when veganism is growing so much. “Not only is this great in terms of inclusivity, but vegan food generally has a lower environmental impact and can help airlines to meet their carbon saving targets. “It is not uncommon for us to hear stories from vegans who had poor experiences on flights, being left only with snacks such as peanuts or crisps. A vegan menu on board Norwegian could include gnocchi covered in a Mediterranean vegetable & tomato sauce with black olives or a chickpea stew with roasted baby aubergine and broccoli in a harissa sauce. Norwegian will commence the UK’s cheapest nonstop flights to Brazil with a brand new four-weekly service from Gatwick to Rio de Janeiro on 31 March. The airline will also begin services to San Francisco and Miami on 31 March.